The jEdit editor is a popular programming editor (Windows/Mac/Linux). 1. Download and install jEdit. 2. Run the editor, and use menu Plugin Manager to install the JythonInterpreter plugin (you may have to use a different mirror – if so, see Download Options in Plugin Manager). 3. Under menu Plugins, select Jython Interpreter. Once it starts, click on the down arrow at top-left, and select Dock At Bottom. Resize GUI panels, as desired. 4. Under menu Plugins, select Plugin Options. In the new window, make sure that the following Jython Interpreter options are clicked: Load at startup, Autoload JARS, Autosave, Save JythonPath, Use UP/DOWN. 6. 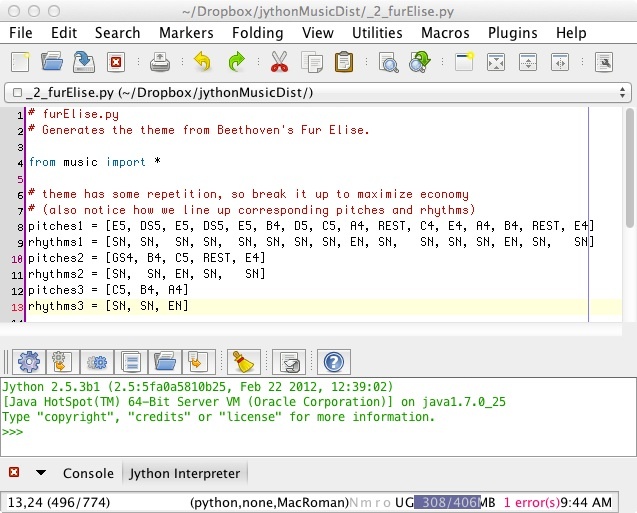 Open file “furElise.py” located in jythonMusic folder. 7. Run it – in the Interpreter window, click the first icon (Run current buffer). 8. If you hear the music, you are all set. Note: When loading a program, jEdit reports an error (see red message at the very bottom of the image below). This is an internal jEdit problem. You may safely ignore it. Using the jEdit editor to run a program.